In the 1950s, Swedish professors Borje Larsson of the Gustaf Werner Institute, University of Uppsala, and Lars Leksell at the Karolinska Institute in Stockholm, Sweden, began to investigate combining proton beams with stereotactic (guiding) devices capable of pinpointing targets within the brain. This approach was eventually abandoned because it was complex and costly. Instead, in 1967, the researchers arranged for construction of the first Gamma Knife device using cobalt-60 as the energy source. Leksell termed this new surgical technique “stereotactic radiosurgery.” The prototype unit, used for 12 years in Sweden, was specifically designed for functional neurological surgery, that is, for treatment of patients with pain, movement disorders, and even certain behavioral disorders that were not responsive to conventional psychiatric treatment. Realizing the potential of stereotactic radiosurgery for treating brain tumors, Professor Leksell and his colleagues built a second Gamma Knife in 1975. It was installed at the Karolinska Institute and became an integral part of the neurosurgical service there. The third and fourth units, built in the early 1980s, were installed in Buenos Aires, Argentina, and Sheffield, England. The next two units built were at the University of Pittsburgh and the University of Virginia. The initial gamma unit design was intended for lesion generation in functional neurosurgery. Through the development of stereotactic angiography, AVMs became suitable targets for stereotactic irradiation as did cranial base tumors imaged with pneumoencephalography or cisternography. In 1980’s, an increasing number of patients had radiosurgery for AVMs, selected benign tumors, and small-volume malignant tumors. Today over 300,000 patients have undergone Gamma Knife surgery and over 35,000 per year receive the treatment. Currently, the Gamma Knife is used primarily to treat benign brain tumors, AVMs, acoustic neuromas, pituitary adenomas, craniopharyngiomas, brain metastases, other tumors of the skull base, and pineal region tumors. Selected patients with movement disorders and trigeminal neuralgia can also be treated. Most users of Gamma Knife technology have restricted lesion size to a mean spherical diameter of 35 mm (and usually less). Although we have treated larger lesions, to maintain safety a significant increase in lesion volume must be paralleled by a decrease in delivered dose. A large decrease in dose for larger lesions leads to a relatively ineffective total dose from a radiobiological standpoint, and probably does not improve upon what might be obtained by standard fractionated techniques. Failure to decrease the dose for larger volumes can lead to a higher complication rate. For certain patients with various deep-seated tumors or AVMs, the Gamma Knife may be preferable to conventional surgery. Because the unit can “tailor” radiosurgical doses to lesions of suitable size (preferably less than three centimeters in diameter), it is used as an alternative approach to standard microsurgical tools in these patients. Because the radiation falloff is very steep outside the target area, the surrounding brain tissue is spared harmful after effects. Gamma Knife radiosurgery also is safer than many existing procedures because patients need not undergo risky, open-skull procedures, and adult patients do not require general anesthesia. Thus, the Gamma Knife is especially useful when conventional surgical techniques would pose high risk, such as in the presence of other illnesses or when a patient’s age prohibits standard surgery. Gamma Knife treatment causes few of the immediate side effects that are associated with conventional external beam radiation. For example, nausea, vomiting, and headaches rarely occur. No infections, hemorrhages, or other standard neurological complications have been reported as a result of Gamma Knife procedures. Patients usually leave the hospital within 24 hours after stereotactic radiosurgery. The basic physics of the Gamma Knife has remained substantially the same since its conception. The device uses 60Cobalt as a radiation source. 60Co decays through beta decay to a stable isotope of nickel (60Ni) with a half life of 5.26 years. As a part of the decay process, one electron with an energy of up to 315 keV and two gamma rays with energies of 1.17 MeV and 1.33 MeV are emitted. It is the gamma radiation that is used to clinical effect in the gamma knife and contributes to the naming of the device. The details of the internal design of the gamma knife changes slightly among the four models currently in use around the world (the U, B, and C models, and the new Perfexion model). Inside the gamma knife unit are an array of 60Co sources (201 sources in the U, B, and C models, 192 in the Perfexion) which are alligned with a collimation system. The collimation system (described in more detail below) focuses the inividual beams of gamma radiation to a very precise focus point. While an individual beam has a relatively low dose rate and causes minimal biological effect, the superposition of all beams at the focus point have a much higher dose rate. The Gamma Knife can therefore target very precise areas of tissue without causing significant collateral damage to areas outside of the targeted area. In the U, B, and C models of the Gamma Knife, the beam collimation in split between an internal collimation and a removable external helmet-based collimation system. Each external collimator helmet has an array of removable tungsten collimators (one per source) with circular apertures that are used to create different diameter fields at the focus point. 4mm, 8mm, 14mm, and 18mm collimator helmets are available. A subset of the collimators may be removed and replaced with solid tungsten “plugs” to block individual beams in cases where additional shielding is required. Modification of the isodose distribution is achieved by using combinations of isocenters using different collimators, different stereotactic locations, and differing dwell times. In the new Gamma Knife Perfexion, the external helmet collimators have been replaced by a single internal collimation system. In the Perfexion, the 60Co sources move along the collimator body to locations where 4mm, 8mm, and 16mm apertures have been created. The Gamma Knife operates on the principles of stereotaxy to achieve a high level of precision in localization. A stereotactic head frame is affixed to the patient’s head before the Gamma Knife procedure. This frame defines a reference coordinate system that allows points in the brain to be located with high precision. During imaging procedures, a system of fiducal markers is used with the frame to allow the location of all areas of interest within the images to be known relative to this stereotactic space. A computerized planning system developed for the Gamma Knife then allows detailed and precise dose distributions to be created that help ensure the target of interest is covered by a clinically significant dose while sparing normal brain tissue. In 2006 Elekta announced a new model Gamma Knife, the Perfexion. This unit represents a significant departure in the traditional design of the Gamma Knife and promises significant gains in treatment efficiency, treatable volume, and patient comfort. This model is awaiting final approval from the NRC for use in the United States. • Internal collimation: The elimination of external collimator helmets. The Perfexion includes an internal collimation system. Rather than being fixed, the cobalt sources are grouped into 8 sectors. Each sector can move in a linear direction back and forth over the internal collimation system, with several stopping positions. Each position corresponds to a different size collimator (4mm, 8mm, 16mm or blocked). Therefore, there is no more requirement to manually change collimation helmets, which eliminates what has traditionally been a significant bottleneck in the treatment process. • Composite isocenters: Because each of the 8 sectors of sources can move independently, it is now possible to create composite shots where each sector is of different collimator size (for example, part 4mm, part 16mm, part blocked). The promise of composite shots is that each isocenter can be more carefully tailored to match the shape of the target. • Automated shielding: With the Perfexion unit, there is no more requirement for manual plugging of collimator helmets. Because one of the source positions is a blocked position, plugging becomes an automated process. In addition, the Perfexion make it possible to shield more of the collimator than was possible in the previous Gamma Knife models. • Simplified patient fixation: The fixation of the stereotactic head frame to the Gamma Knife has been redesigned in the Perfexion to simplify the fixation process. A special adapter is attached to the head frame, and this adapter fits simply into a head holder attached to the bed. The weight of the patient’s head can be supported at all times by the bed, which represents an improvement over the current situation where the patient’s head must be supported by the operator. • Improved patient comfort: The mattress on the Perfexion model is significantly thicker, and supports the patient much higher up the back than the mattress on previous units. In addition, because the entire bed of the Perfexion moves from position to position (rather than just the head), the relative position of the patient’s head and neck does not change during the treatment. These two changes promise to significantly improve patient comfort. • Increased treatment range: The elimination of the external collimation helmets opens up a much larger potential treatment volume in the Perfexion model. This means that many cases which could not be optimally reached in one treatment or that required awkward positional changes during the treatment will now in most cases be easily treated in the new unit. In addition, the Perfexion has the potential ability to treat indications down into the lower cervical spine. While this will require changes in fixation techniques and dose calculation algorithms, the new unit promises to significantly expand the pool of potential indications for the gamma knife. A multidisciplinary team of neurological surgeons, radiation oncologists, medical physicists, radiologists, nurses, computer specialists, and physician assistants unite to provide the patient with comprehensive, advanced care before, during, and after the procedure. Patients are selected for treatment after thorough review of all prior records and imaging studies. After admission to the hospital, the patient undergoes placement of a stereotactic frame, a mechanical guidance device, to the head. During frame placement, the patient receives a mild sedative administered in the OR by an anesthesiologist. As such, the frame placement is pain free. Then, the patient’s condition and the location and type of tumor or AVM are evaluated with advanced imaging technology, such as computed tomography (CT), angiography, or magnetic resonance imaging (MRI). Next, the patient’s head is placed within a large helmet-like device with small openings called “collimator ports.” Radiation beams are adjusted through these ports to direct the appropriate amount of energy precisely at the target tissue. The Lars Leksell Gamma Knife suite at the University of Virginia consists of patient preparation areas and rooms for imaging evaluation and computer dose planning. 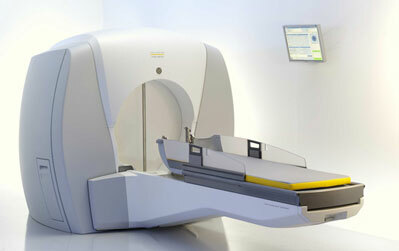 The Gamma Knife is housed in specially shielded room equipped with television monitoring and two-way voice contact. The suite also contains equipment to anesthetize the patient if necessary. The University of Virginia was one of the first two institutions to get a model U Gamma Knife in the U.S.. The Lars Leksell Center for Gamma Surgery opened with this model in March 1989. In 2001, the center traded in its Model U for a Model C unit with its automatic positioning system. In 2006 the center reloaded the unit with fresh cobalt sources in this unit to maintain acceptable dose rates and treatment times. In the fourth quarter of 2006, the center decided on its next step towards the future by becoming the first center in the United States to purchase the new Gamma Knife Perfexion model. This model was installed and became operational at UVA in 2007.